Dr. Barbara Benton Sotomayor has devoted her distinguished career of 40-plus years to improving educational opportunities for students in Tucson. At THS her varied activities helped foster her commitment to community service and enhanced her leadership abilities. After graduating from the University of Arizona, Barbara worked as a teacher, principal and Tucson Unified School District administrator, helping to establish district programs that still thrive today. Among other TUSD positions, she was Assistant Director of Title I Programs, Director of State and Federal Programs, Executive Director of Instruction and General Studies, and Director of School Community Relations. In the late 1980’s, she directed development of the district’s first successful federal magnet grant application. That set a strong foundation for today’s district magnet schools. In 2004, Barbara and a colleague successfully wrote another magnet grant and TUSD received $9.9 million over three years, of which THMS received $4.7 million. She also developed the district’s first successful grant application for 21st Century Community Learning Centers. Collaborating with the UA, she helped develop the first MESA (Mathematics, Engineering, and Science Achievement) high school clubs in TUSD. 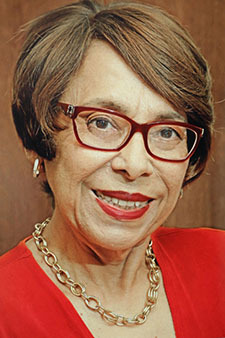 In 2000, Barbara chaired a Magnet Schools of America International Conference and received the Magnet Schools of America Award. In 1970, Barbara earned a master’s degree at the UA. She was named an outstanding alumna of New Mexico State University, where she earned the degree Ed. Specialist in Educational Administration in 1976.She earned a doctoral degree in 1999 in educational leadership from Northern Arizona University. Barbara is known as an exemplary role model and mentor to young teachers and staff members. She influenced the career of many educators as a professor for NAU. In her community service, Barbara helped found two charter schools as a board member for Chicanos Por La Causa, Tucson. Dorothy Magett, then TUSD acting superintendent, once wrote to Barbara: “I have been very impressed with your self-imposed high standards, your dedication to quality performances, and your willingness to go beyond assigned responsibilities to assist in the achievement of organizational goals…Tucson Unified School District is a better place because of you…”.